Well, here I am, the Memorable Kitchen…celebrating 2 years of blogging and sharing my 100th post! Wow! What does that all mean to me as a blogger, home cook, wife, mother and grandmother? Well, quite a bit. First of all, 5 years ago, I probably could not have told you what a blog even was. I thought it was a new form of “soap box” where one could go on and on about whatever was on their mind. Well, it can be that, but what I have learned is that it is a website where the content is fluid…changing all the time. A blog can be useful information on everything from exercising, to parenting, to aging, to traveling, and of course, my favorite…cooking. It is a pretty awesome go-to tool when you are looking for information about your favorite subject matter. Now, the best part about it is that the material is being presented by a real live person who has an interest, usually a deep interest in whatever they are blogging about. It is not just generated by a search engine, but presented by someone who has a passion for something, has experienced it first hand and wants to share their love for, whatever, with his or her followers. So, what does this all have to do with Rainbow Angel Food Cake? The name of my blog, The Memorable Kitchen, is just that. A collection of memories I have from cooking experiences both past and present. Memories of my parents teaching me how to cook. Times spent with friends throughout my life, who were also great cooks and loved to share their recipes. And finally, moments of inspiration, learning and creation that come out of my kitchen today. 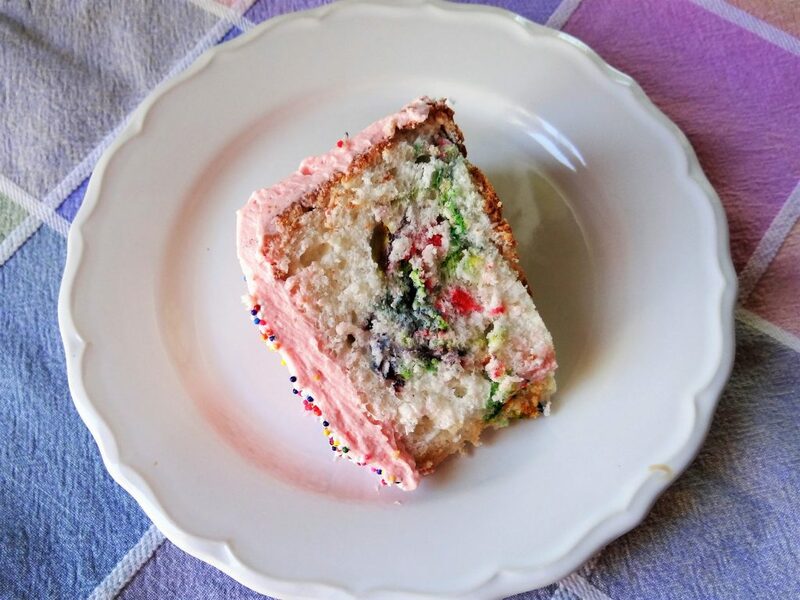 Well, in celebration of my 2nd Blogiversary (that is the technical term), I am sharing my most favorite, always requested, can’t pass up cake recipe…Rainbow Angel Food Cake! Ta Da! I consider it the best celebration cake recipe ever. It all starts with a basic angel food cake recipe. Not very many ingredients, that come together to make a beautiful, light cake. Then what turns it into a work of art is the simple step of swirling food coloring throughout the batter to create a colorful pattern inside. 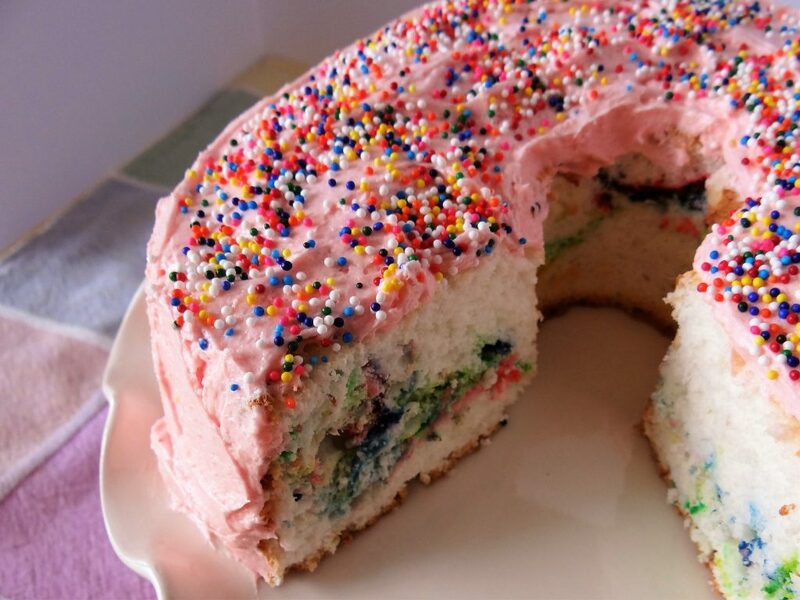 Now, I am not sure how many of you have ever made a Rainbow Angel Food Cake from scratch. An angel food cake is quite simple to make and if you are watching your calories and fat, it is a very friendly dessert option. It is mostly made from egg whites, some sugar, cake flour and extracts. It bakes best in a tube pan, although you can also use loaf pans. If you are not feeling over ambitious, you can also use a box mix for the angel food cake. It works well too. But the best way to get the lovely swirls of color in the cake is to use liquid food coloring. 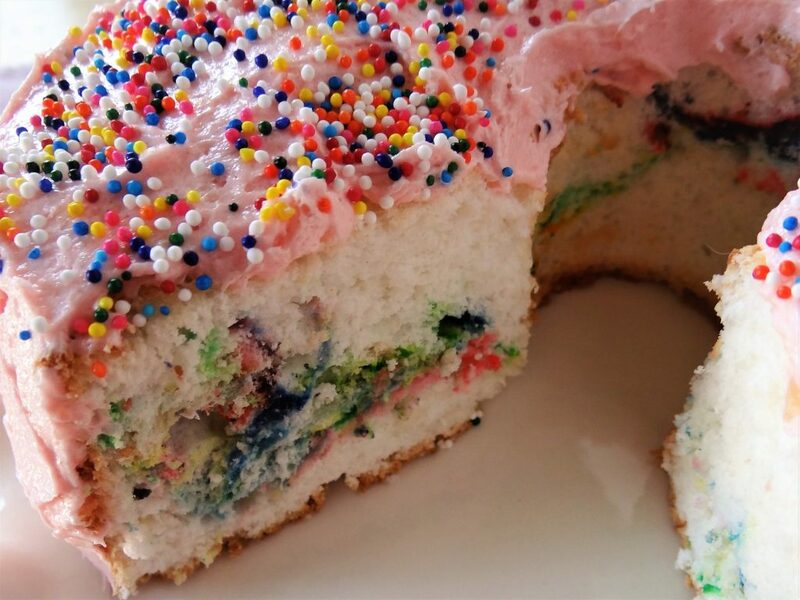 It blends through the batter much better than paste or gel food coloring, which creates the beautiful “rainbow affect”. As a child, I was in awe of rainbows. The fact that something so incredible could literally be painted in the sky just amazed me. So, of course, my mother being the best mom on the face of the earth, one year decided to make me a Rainbow Angel Food Cake. When I first saw the cake, it just looked like a frosted cake. But, when she cut into it and revealed the magical colors that were hidden inside, I felt like the most special birthday girl ever! How could my mom create such a masterpiece? Well, because that is the type of mom she was and she always made sure every birthday that we celebrate was more incredible that the one before! What is really great about this cake too is that it can be a part of a color theme for many different celebrations. Swirl in just blue and red food coloring for patriotic holidays or red and green for Christmas. Color it with either blue or pink for a Gender Reveal Party. Use your imagination for endless color combinations. So, enjoy this recipe that has been a favorite of mine since childhood. One that always made my birthday special. One that reminds me of my incredible mom. One that I have loved sharing with my own children. And one that will live in my heart forever. It is especially fun to share it with you for my Anniversary as a blogger. Thank you for visiting my blog over the past 2 years. My hope is that the recipes and stories I have shared have somehow made their way into your kitchens so that they can, in turn, be shared with others. I look forward to learning more about blogging and watching the Memorable Kitchen blossom into a sight that you enjoy returning to for special recipes. Enjoy your time in the kitchen, the memories you create, and the people you share it with! Happy Cooking from the Memorable Kitchen! Preheat the oven to 375 degrees. Place oven rack on the lowest setting. Make sure all bowls, beaters and utensils used are clean and free of any grease. Sift together flour and ¾ cup sugar. Set aside. Pour half of the batter into an ungreased angel food pan or two 1½ pound loaf pans. Place drops of food coloring, one at a time, in various locations, about one inch apart, on the batter. Use one or several colors to create the desired effect. With a butter knife, pull through the batter, swirling the knife in circles. Be careful to not completely mix the colors, but to just create a rainbow effect. Pour the remaining batter on top. Smooth with a knife to even out the batter in the pan. Invert pan onto a plate and cool completely. Run a butter knife around edges of the cake to loosen. 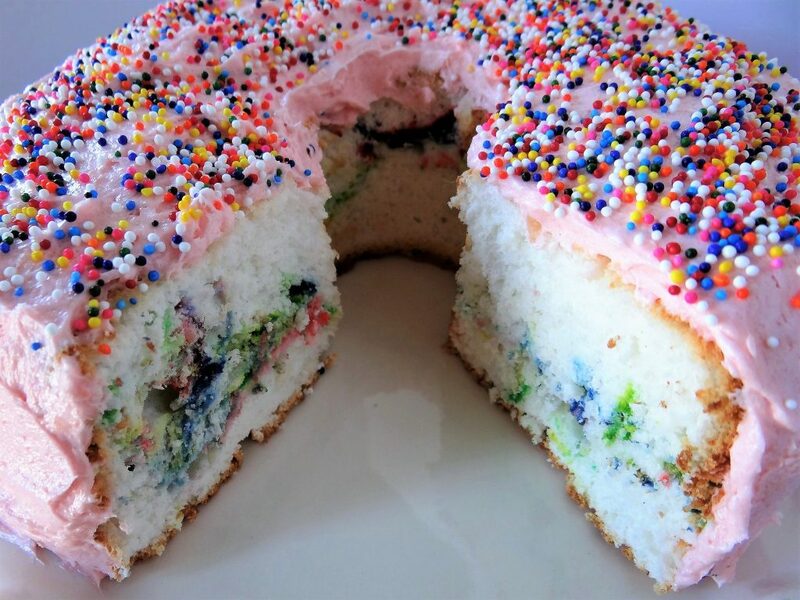 Remove from pan and decorate with icing and sprinkles. Note 1: Soft peaks barely hold their shape. The peaks flop over immediately when the beaters are lifted. Note 2: Stiff or firm peaks stand straight up when the beaters are lifted.